570 pages | 44 B/W Illus. Tourism is much more than an economic sector, it is also a social, cultural, political, and environmental force that drives societal change. Understanding, responding to, and managing this change will inevitably require knowledge workers who are able to address a range of problems associated with tourism, travel, hospitality, and the increasingly complex operating environment within which they exist. The purpose of this Handbook is to provide an insightful and authoritative account of the various issues that are shaping the higher educational world of tourism, hospitality and events education and to highlight the creative, inventive and innovative ways that educators are responding to these issues. It takes as its central focus a dynamic curriculum space shaped by internal and external factors from global to local scales, a variety of values and perspectives contributed by a range of stakeholders, and shifting philosophies about education policy, pedagogy and teaching practice. A benchmark for future curriculum design and development, it critically reviews the development of conceptual and theoretical approaches to tourism and hospitality education. The Handbook is composed of contributions from specialists in the field, is interdisciplinary in coverage and international in scope through its authorship and content. 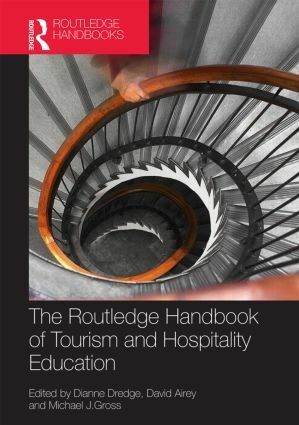 Providing a systematic guide to the current state of knowledge on tourism and hospitality education and its future direction this is essential reading for students, researchers and academics in Tourism, Hospitality, Events, Recreation and Leisure Studies. Dianne Dredge is Professor in the Department of Culture and Global Studies, Aalborg University, Denmark. She has 20 years experience as a tourism and environmental planner in various locations including Australia, Canada, Mexico and China. Dianne’s research focus is on tourism planning, policy and governance with a particular focus on the role of the state, relational and discursive policy development, community participation and capacity building. She also undertakes research in higher education policy, teaching and learning. Dianne won an Australian National Carrick Citation for Outstanding Contributions to Student Learning in 2007, and was Chief Investigator on the national project ‘Building a stronger future: balancing professional and liberal education ideals in tourism and hospitality education’. Michael J. Gross is a Lecturer with the University of South Australia in Adelaide. Michael holds a Bachelor of Science in Business Administration (BSBA) with a major in Hotel and Restaurant Management from the University of Denver, Masters Degrees in Education (MPET) and Business (MBA) from Deakin University, and a PhD from the University of South Australia. He has an extensive professional background in international hospitality management with some of the world's leading hotel firms. He currently teaches in hospitality and tourism programs at the undergraduate and postgraduate levels. His research and publishing focus are on hospitality management and tourism management areas, with particular interests in international education, development and internationalization of hospitality firms, China hospitality industry, destination marketing, destination image, lifestyle tourism, consumer involvement, and place attachment.